Good ol' Victor is pretty fun to draw. If a hero is only as good a their villains, She-Ra was every bit as rad as He-Man. As much as i love Punisher, this is somehow the first time i've ever drawn JIGSAW. The monster one, this time. 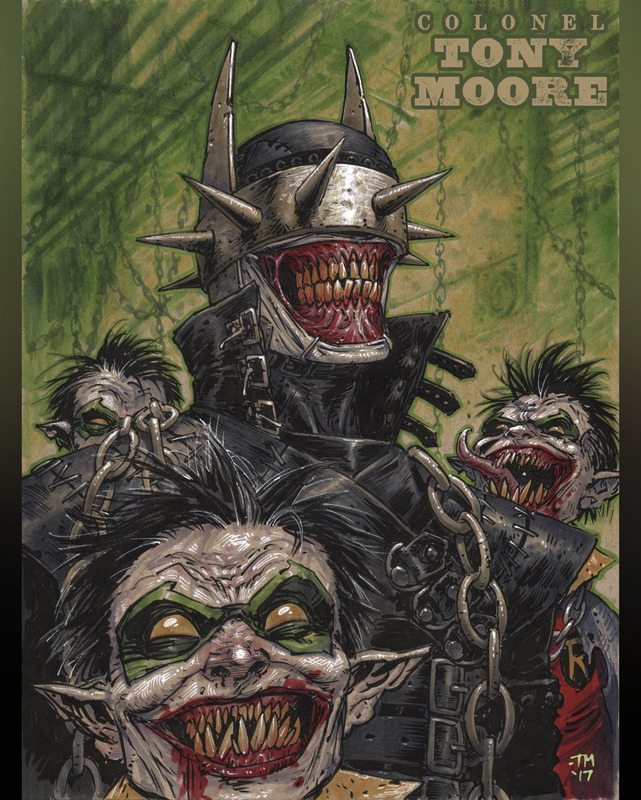 This commissioner wanted THE BATMAN WHO LAUGHS, which is the new Batman/Joker/Cenobite mashup happening over in DC METAL. Pretty fun subject to play around with. You can commission your own custom piece over in the STORE. It's been a helluva while since i did daily sketches, but i've recently added COMMISSIONS to the site, and orders are starting to roll in, so i figured i'd post what i've been doing for those as well as some i've done recently just for the hell of it. 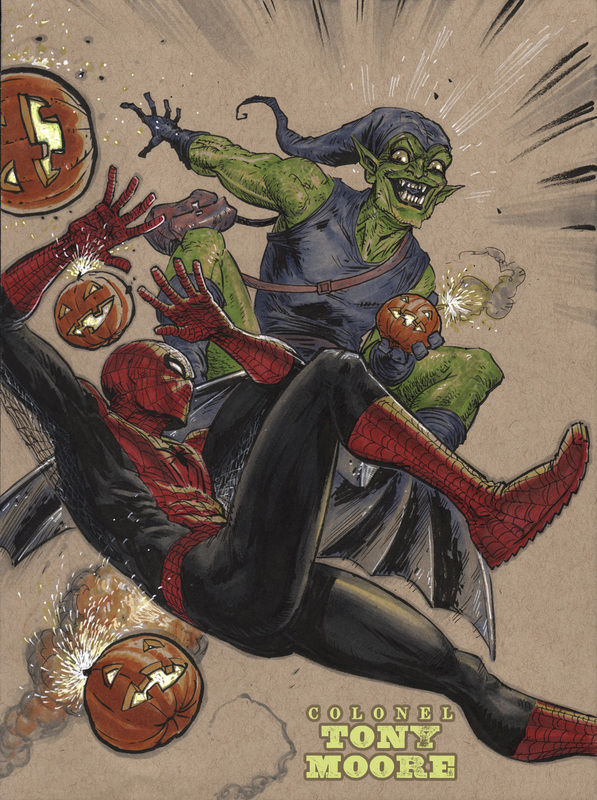 This costumer requesed Spidey & Green Goblin, with a Romita influence. i had a lot of fun with it, since i'd never drawn GG before. I enjoyed Space Ghost as a kid, but the absurdity of Space Ghost Coast To Coast really hit me like a ton of bricks as a teenager, and left an indelible mark on me. Here's a super-rendered ink drawing of the intergalactic villain and sardonic music man, ZORAK! This piece is 9" x 12", ink on Strathmore Bristol board. You can find the original art for this piece available over in my STORE. Some time ago, i did a live broadcast on my Periscope (@tonymoore), and this was one of the requests i took. I love all the Batman rogues, and one day, i plan to revisit Two-Face and do up a fully rendered chipboard piece. A while back, i did a broadcast where i sketched up a big pile of 5-Minute requests. BATMAN has all the coolest bad guys, and KILLER CROC is no exception. Oddly enough, i think this is the first time i've ever drawn him. Today's selection is the Asgardian god of mischief himself, LOKI! i know everybody likes Tom Hiddleston, but let's be honest, the real star is that badass horned helmet. I've always had a soft spot for Judge Dredd's Dark Judges, and here's my rendition of JUDGE DEATH! Today's choice was The Little Mermaid's URSULA. Admittedly, i mostly wanted to draw Flotsam and Jetsam, but i ended up having a blast on the whole thing. And so ends my week of Disney villains. Perhaps i will revisit this theme again someday, because it was pretty damn fun. This week, i'm doing five Disney villains. 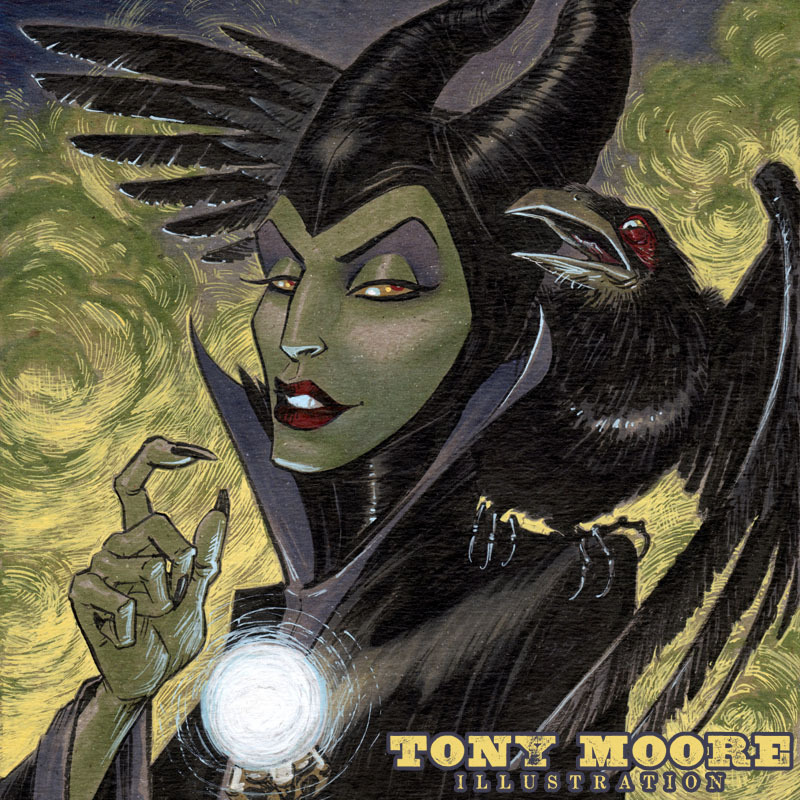 Today's choice, MALEFICENT from Sleeping Beauty. One of my personal favorites. It was really tempting to draw her as the dragon, but my daughter really wanted to see me draw her as the sorceress with some green smoke. And hey, there's always future days' sketches!